We hope you have all had a relaxing summer and are now pumped full of energy to start a new academic and working year! 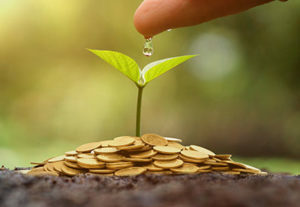 In this newsletter we have one article and one opinion piece about money, values and economics by Cranes Nicolas Jones, who works in ethical investing, and Ely Loew, who comes from a background of economic politics. Both raise some interesting questions that we all might want to think about as people with principled values. We are keen for members to take part in the discussion by sending us your comments. The website, on which we intend to have a dedicated space for discussion, is currently under construction and is estimated to be ready by the end of 2017. In the meantime, we will publish your comments in following newsletters. Over the last three months the pace of the Directors has not slowed, as you will see in the first three sections outlining developing initiatives: including budding collaborations with affiliated organisations, and the genesis of the Skills Database and CV clinic. Two of our Directors, Sonja Read and Jung-Jae Hur also gave a talk about Cranes Club at the UK annual gathering festival, which you are able to view on youtube. You will also find updates about the different Cranes Club supported activities and projects. 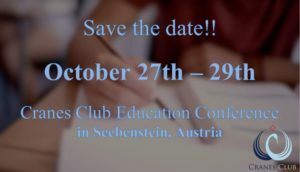 Note especially the Education Conference, 27-29 October in Seebenstein, Austria, and the Health conference 3-5 November in Camberg, Germany. The conferences themselves are open to anyone, so feel free to spread the message within your communities, and remember that as a Cranes Club member you will be able to participate with a reduced fee! We want to thank you all for being part of our diverse and growing Cranes Club Europe community (check out exciting developments in Membership Stats). We are really beginning to build something special that has a lot of potential, and we look forward to working together with you and all other members on this. Since the last newsletter the Cranes Club Directors have begun exploring initial opportunities for collaboration with two organisations: Cranes Club USA and FFWPU Europe. With the former, there may be some opportunities to organise webinars together, and potentially a common conference will be organised at some point. CC US have particularly organised webinars for early career professionals and students. If you have any wishes for a particular webinar, feel free to suggest a topic and we can try to arrange this. Likewise, if you want to organise a webinar on a topic (alone or with someone), get in touch with us. With FFWPU European HQ we have discussed sharing with them the skills part of the database and potentially link up skills with specific projects or needs of communities across Europe (at the moment this would work through us and you would not be contacted directly). There may also be opportunities for Cranes Club members to organise sessions in their field of expertise at leadership conferences to support capacity building, and for CC to design internship programmes for FFWPU. All members will have recently received an email from us telling you about a membership and skills database for Cranes Club. At the moment, the database will consist of a shared document that will list members details (minus email address unless specified) and skills or services that you are willing to offer. The database we are building would be used for the sake of connecting cranes within and across industries and possibly also for the sake of offering either free or paid services to future CC partners (e.g. Unificationist organisations and associates). This database will be made available to members and you will have the opportunity to edit your details, including services. We have already constructed a preliminary database based on your information from LinkedIn; however we would greatly appreciate it if you could take a moment to verify your information. Are you fine for your email to be included? Do you have any free services you can offer Cranes Club and/or its partners? Are you willing to offer discounted rates to Cranes Club and/or its partners for paid work? We recommend Cranes Club members to offer at least some kind of free service to Cranes Club members and partner organisations. For example: Ely Loew has been providing online marketing consultation services to members and organisations. His policy is to offer 30 min for free, but for more support he will offer services at a discounted price. If you did not reply by Sept 5th, your information was included, but these additional columns were left blank and your email address was not included. One of the primary aims of Cranes Club is to work towards a sustainable mentorship program in order to build a culture of internal empowerment with our community. This year we have decided to introduce The CV Clinic. For many jobs, a CV is your first impression and like all first impressions it really matters. The Cranes Club CV clinic is designed to give individuals support and advice to produce a CV that will deliver key information to employers and leave a lasting impression. Applicants to the clinic will have their CV sent to a Cranes Club mentor who is experienced in a relevant field. They will then offer important feedback via email or skype to help improve CV quality and tailor it to the needs of the potential job. This service will be free for members, but will also be available to non-members at a small cost of 15 euros for 2 hours. - InSun Tribe, Psychology BSc graduate, was paired with Elisa Brann who has worked in research and is a PhD student in the area of Psychology. If you are interested in supporting or using the CV clinic please get in touch and we will do our best to match you with an appropriate mentor (see membership stats to get an idea of what areas our Cranes specialise in). Those interested in using the service should submit an initial CV along with job descriptions of their interest. It has been a busy two months since we last met, as is evidenced by the wealth of updates! At the AGM, membership voted in favour of Cranes Club Europe supporting the organisation of a second Health Conference and a new Education Conference, both of which are already in the works. Furthermore, the project incubators held at the meeting are taking flight too! Here are the latest news and updates about their progress. The first Cranes Club Education Conference is now open for applicants to sign up! It will be taking place from Friday, 27th - Sunday, 29th of October 2017 in Austria - Villa Riehl, Wiener Neustädterstraße 101, 2824, Seebenstein. The deadline for applications is 15th of October 2017. The cost of the event will be 100euros, which includes accommodation and the registration fee. Please download the invitation for full details, including information about travel, how to get involved and membership discounts. Detailed information has been sent out in a separate email. A link to that can be found here if you missed it. For any suggestions of program, get in touch with Viola Hara, Sonja Read, orCatriona Valenta. 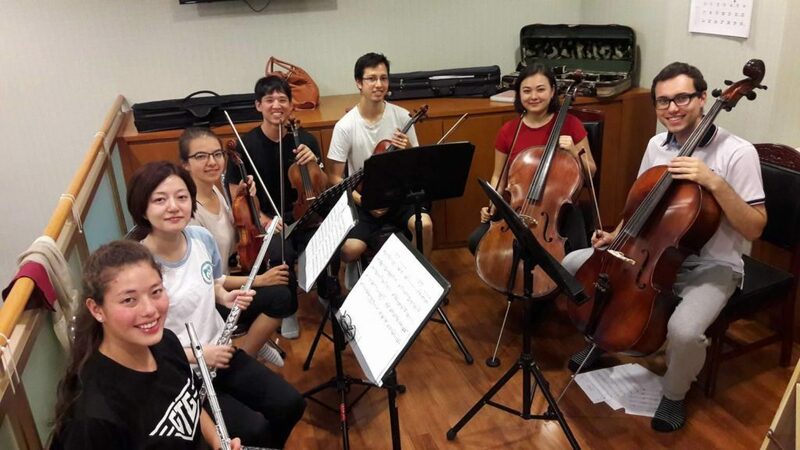 Benjamin Lajda, who presented his project incubator 2nd Gen Orchestra at the Annual Conference this April, has had a very busy summer in Korea where he has begun the first steps in building a musical cooperation amongst Second Generation members of the Unification Church community. He has played a considerable role in coordinating a choir and orchestral performance for the Victory celebration on the 8th of September - so for those who watched it, hope you enjoyed it! Preparations for a music workshop that will more closely bring together European members, is still in preparation for later this year. If you would be interested in attending or supporting Benjamin, or know a keen musician who might, please get in touch with him. Benjamin with other members of his Orchestral ensemble in Korea. How are your investments doing? I hope well. Although we might not all own company shares (yet), we are all investors and have been for a long time. The clothes you wear and the phone you own are tangible returns on the investment you have already made into the store you shopped at and the brands you chose. An immediate return on investment, wonderful. These companies have had the privilege to share in your hard-won earnings. Your purchase has in a way been like owning a share in the company since part of the company's wealth is yours. Your clothes and phone are like the certificates of those shares. I must also mention that in my opinion, these are voting shares. A purchase is an endorsement and a vote of confidence. It is a signal that the company have your support. It encourages them to continue what they are doing and how they are doing it. Now consider how some of these companies are truly gigantic and very powerful. When a giant moves the whole world feels it. If the giant steps in a good direction there are opportunities for hundreds of families to be provided for and spend more precious time with their loved ones. If the giant takes a step the other way then they must work to the point of physical and emotional exhaustion for almost no reward, sometimes going beyond breaking point and not returning. Actually, you don't need to imagine these things. They are happening all around the world. The point I want to make is that how we use our money is a global issue. It is a moral issue and to me it is a spiritual matter also. This view has been held by people for a long time. John Wesley, one of the founders of Methodism, famously delivered a sermon “The Use of Money” calling for business practices that avoid industries that harm their workers. Another example is that of sweet makers and their customers in Georgian England. They decided to source their sugar from slavery free sources despite the extra cost. People proudly wore specially created badges on their chests showing their support for more ethical sweet producers. This was influential in the abolition of slavery. There are numerous examples of this simple activism throughout, in everything from footwear to banking. Today the organisation Ethical Consumer assists thoughtful people to choose products more in line with their morality. On their website, you can find shopping guides giving products an ethical score and ranking them. The main criteria are environment, animals, people, politics and product sustainability. You can even customise the rating to match your personal feelings by increasing or decreasing the importance of each category. Anyone aged 18 or older can invest in ethical funds of their choice whether they want it to be carbon neutral or want to invest in companies solving the world's clean water crisis – whatever is most important to them. As advisers, my family’s business has access to a whole range of investments and are happy to help find the most suitable one for you. We are especially happy to help fellow Cranes prosper. We want to play a part in restoring finance. 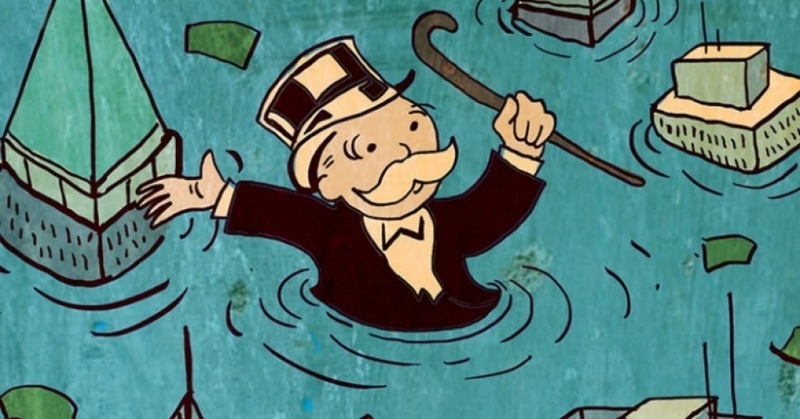 In the UK alone there is more than £5.5 trillion of wealth in investments. Less than one percent is ethically invested. Will you help us change that? I hope to see Cranes Club members be exemplary in their fields and gain fortune that enables us to transform society. Nick and Chris Jones run a family business in Manchester, England, providing financial services expertise for families and businesses to create a successful financial plan for their feature. They specialise in retirement, investment and insurance products to protect what is most valuable to you and grow your wealth for the future. If you want to learn more about ethical investing and creating your own customised financial plan please get in touch: info@hgfinancialplanning.co.uk. Initial meetings are always free of charge and we are especially happy to talk to Cranes Club members. Is capitalism good or bad? It is an important question for our members, as there are many economic, political, and even theological implications. In the States, capitalism is intrinsically tied to the Republican Party, and many of our members link capitalist ideals to the fight against Communism and Father’s dedication to bringing down the communist world. The word socialism, by contrast, is instantly linked to Communism and the terror that accompanied it. I believe our members in Europe are more open to the idea of socialism, but as a result more skeptical of capitalism, since the socialist systems work in many parts of Europe (e.g. the Nordic countries). The general political tension between right and left economic politics concerns the level at which government should get involved and regulate the free market. The more government gets involved, the more socialist a country is considered, and the less regulations that exist, the more capitalistic a country is considered. People point to different pros and cons of various capitalist and socialist countries to emphasize their own belief in which system works better, but ultimately there are too many variables involved to make a fair comparison. Furthermore, even socialist countries operate on a capitalistic basis, with a relatively free market and goods that are bought and sold based on supply and demand. All this provides a simple summary of capitalism and its influence on our modern society and politics. In studying the theory of capitalism, I’ve always been bothered by the concept of an invisible hand driven by self-interest, mostly because it struck me as being incredibly unprincipled. As I’ve grown older, I’ve grown more convinced that our understanding of capitalism is wrong, or at the very least incomplete. The financial crash in 2008 reinforced what my own experience was telling me; that self-interest often did more harm than good in a free market system and society. However, we know that capitalism works, at least better than other systems in history, so if self-interest is destructive, why does capitalism work so well? This brings me to the economic theory I’ve been developing while trying to answer the question of how capitalism works, and also how should it work to build an ideal and principled society. The theory is still a work in progress, and probably quite controversial, but I feel confident enough to present my ideas to a sample size of people (a.k.a. “Cranes”) who can provide good feedback and discuss the nuances of the theory. First, and the core pillar of my theory, is that an extreme unequal distribution of wealth is not morally defensible. 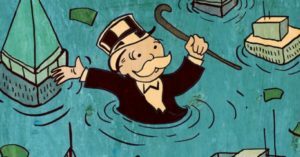 Extreme income inequality is a symptom of a system that isn’t working, so as a wider society we should aim for a relatively equal distribution of wealth. There will always be variance, but the variation should be within a certain percentage. The Gini coefficient could be a good way to measure this in the short term. The second pillar of my theory is that you can’t force a relatively equal distribution of wealth. It has to be voluntary, which means that individual people have to decide that they want to work towards that goal. These two pillars together make up the title of my theory, which is the Voluntary Equal Distribution Of Wealth (or VEDOW). Why would wealthy and successful people in a capitalistic society want to work towards a more equal distribution of wealth? Because they will, in the end, also benefit and this is where theories matter. The fact that we believe so strongly that self-interest drives success leads to destructive practices, such as multi-level marketing, exploitation of workers, and people buying homes that are obviously overvalued, to give a few examples. In addition, wealth is only a means to an end, and multiple research shows that extra money doesn’t generate incremental happiness. What could generate extra happiness? A little bit of LFSO. This leads to the third pillar of VEDOW, which is that people, and not systems, drive everything. At the end of the day, there are no governments or corporations that are separate from individual people. This means you can’t separate an economic or political system from the moral, religious, and traditional beliefs of the people who make up that system. People are not the hyper-rational beings proposed in most Macro/Micro Economic classes. They are driven by personal motives and goals, which often do not include money. Prof. Yunus’ idea of a social business, which he built, pioneered, and later won a Nobel Peace Prize for, gives us a very good example of this, and is an inspiration for a lot of the ideas behind VEDOW. The fourth pillar of VEDOW directly addresses the issue of self-interest. It is not self-interest that drives economic growth, but a combination of self-interest and the “value added” to society. This aligns with the Principle of Dual Purposes (p.33 in the DP), which states that the individual and higher purpose have to mutually benefit. In other words, entrepreneurs have to contribute something to society in order to make a profit, and profit is a reflection of the amount they have contributed. There are a lot of caveats to this, because people are still very self-interested and abuse the system, but in most cases, successful businesses have an element of serving the greater good to balance out their self-interest. The fifth and final pillar of VEDOW, is that there is a limit that a societal value (a.k.a. profit) can rightly be attributed to a single person or managed by them. The implication of this pillar is that large governments and large corporations will both suffer from diseconomies of scale, because they have passed an efficiency point per person that manages those funds. For example, a large corporation sitting on $10B worth of cash reserves will probably have a Board of Directors of 10 - 20 people that determine how that $10B will be spent, and usually they decide to just leave it lying around. What a waste! In conclusion, I think the theory of capitalism is not correctly describing the driving forces of economic development. The wrong theory promotes the wrong behavior, or justifies bad behavior, which is turn damages the economy, and ultimately people’s lives. What we believe matters, and I think we have an opportunity to re-define capitalism in a way that is Principled and that helps drive the right behavior and cultural change, as well as being a more accurate description of what has been working in our modern society. I’m open to hear what other Cranes think of these concepts, as I’m still developing them myself. Youngil Ely Loew studied International Political Economy at the University of Bridgeport, USA. He is currently a digital marketer, working with the world’s largest advertisers on integrated Video and Display product solutions. He is National Leader of FFWPU Ireland and a dedicated father to a growing family. His long-term goal is to go back to school for a PhD in Economics and establish his VEDOW theory in more detail, eventually using it as a core political philosophy behind his 2040 Presidential campaign. He is more than happy to hear your feedback and thoughts, so get in touch: loew01@gmail.com. We thought it would be encouraging for us to share with our fellow Cranes our exciting membership data. 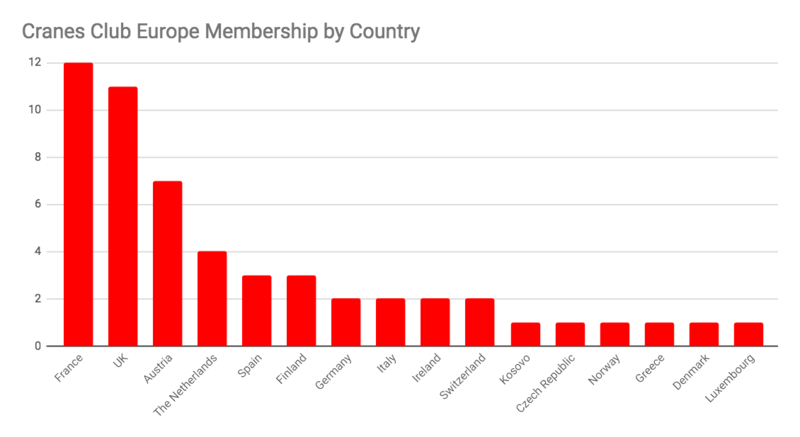 Since last year, membership of Cranes Club Europe has more than doubledin size (leaping from 26 members throughout the whole of last year, to 56 in the last 6 months)! It is truly inspiring to see things moving and we hope you will join us in continuing to spread the word and get others involved. 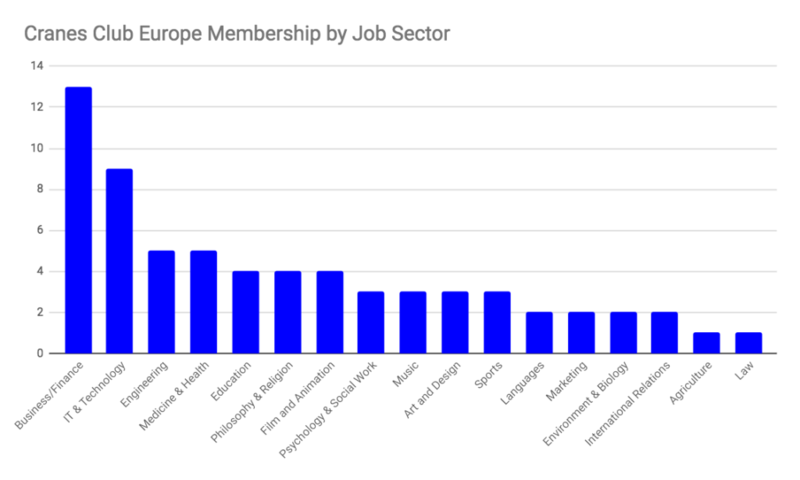 Below you will find a breakdown of membership by job/study sector and country to help give you a more in depth idea of how collaborations can be built. The first graph includes all the different fields that members mentioned in the signup form, so one person may be counted for several fields. The second graph is based on country of residence. After we have set up the database you will be able to get in touch with fellow Cranes directly. In the meantime, if you would like to get in touch with other members within your field then we are happy to facilitate, so just send us a message! The other directors decided it would be a good idea if I took care of the comic relief this time. It can be as simple as that. Just laugh more and others can’t help but at least cracking a smile. After all, laughter is highly contagious. This technique works particularly well if God has endowed you with a particularly weird or unusual laughter. All you need then is to start laughing about something random and others won’t be able to resist joining in. 3. Live in the moment! Don’t use the joke your grandfather told you. (When he tells it to you for the 84th time, you still gotta laugh heartily about it though… Remember the third commandment: respect your parents’ jokes.) Instead you should build your joke on an existing situation and you’ll definitely reach the goal of getting your friends to rapidly sniff air out their noses. 4. Make fun of yourself! Sorry, I’m trying to write a funny piece but this is actually a serious point. Don’t poke fun at others or your joke might go sour like Jesus’s Easter weekend. The safe way is to at least first make fun of yourself. 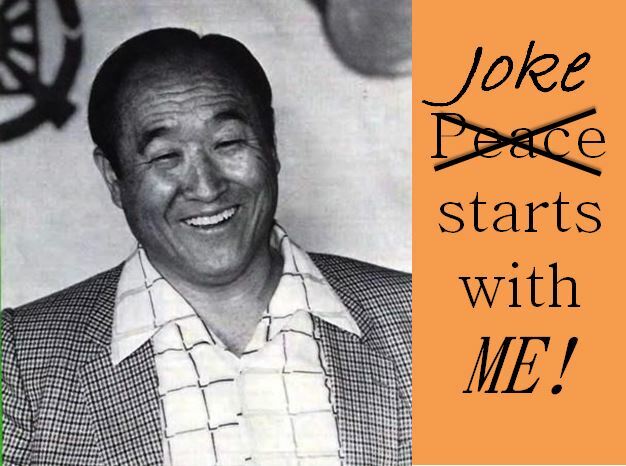 Laugh about yourself and others will find it easier to laugh about themselves. No, I don’t mean you should rip a big one during silent prayer time. 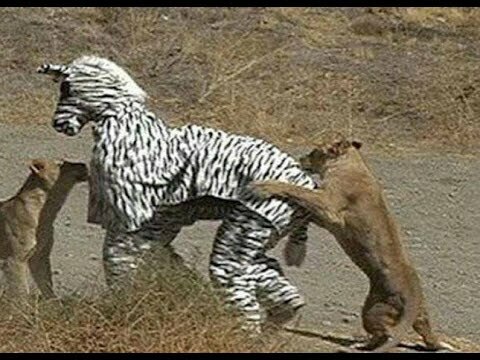 Instead when being funny, take breaks… build the anticipation… and then… rip a HUGE one! Nah, please, just say the punchline at that point.